It's a sign of the times that something which once - eighteen months or even a year ago - was seen as out of reach of a great many people, now comes bundled with some PC systems. 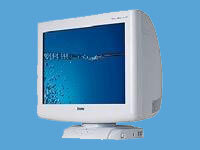 So it is with flat panel monitors, even 17-inch ones such as the clumsily-named 170S4FB from Philips. 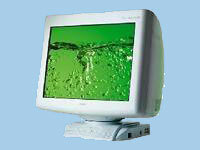 As you might expect, Philips has a large number of panels in its monitor range. This is one of the company's new generation of LCD panels. 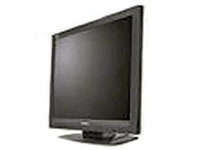 With a full 17-inch diagonal viewing area, the 170S4B is more akin to a 19-inch CRT monitor and thanks to its thin bezel and black finish (hence the 'FB' in the name) it's also a stylish monitor. To keep the costs down, Philips uses just a single 15-pin D-Sub - i.e. 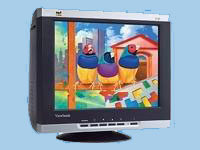 normal VGA input - with no DVI port, USB hub or built-in speakers (although speakers are available in an optional multimedia base). A point in its favour is that the monitor uses an embedded power supply, so you won't have the clutter of an external power supply brick. The screen is a doddle to set up; just plug it in and let the auto adjustment do its job. It also has a fairly fast 25ms response time, making games and DVD playback blur-free. Philips claims that it has a maximum viewing angle of 160 degrees in either plane, which seemed realistic to us and is better than average for a monitor in this price range. On the downside, there is no height adjustment or swivel to the base and there's only a limited amount of tilt, so this isn't really an ideal display from an ergonomic point of view. You can move the whole monitor on its base plate, of course, but that requires a fair amount of effort and isn't something you'd want to do every day. 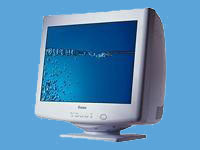 The bottom panel holds all the control buttons, which can be used to alter the brightness and also manipulate the on-screen menu system when configuring the display. The buttons all are positive to the touch and easy to use. The screen itself has a native resolution of 1,280 x 1,024 pixels with a recommended resolution of 60Hz, but if this isn't suitable it can go to 75Hz (although this shouldn't be necessary since there's no loss of image during each 'pass', as there would be in a CRT monitor). Colours are sharp, as is text, and prolonged use didn't bring on any significant eye strain. If you are looking for a stylish, no-nonsense, 17-inch TFT monitor, then Philips's 170S4FB is worth more than a second glance. It's well priced, has a good quality screen and - if you don't mind the basic VGA connection and similarly basic stand ergonomics - should suit any PC system.